Boot Camp is a very useful macOS tool that can help you install and use Microsoft Windows on your Mac. Several users have reported that they are receiving the “The startup disk cannot be partitioned or restored to a single partition. 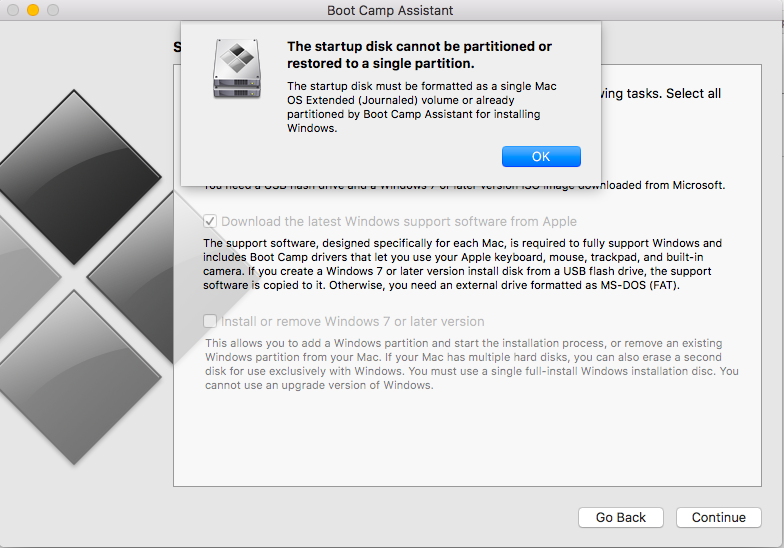 The startup disk must be formatted as a single Mac OS Extended (Journaled) volume or already partitioned by Boot Camp Assistant for installing Windows” error (see the image below) when they attempt to use, install or remove Windows on Mac with Boot Camp Assistant. This article explains how you can troubleshoot this error. If you are having this problem too, please try the following tips. Please note that before trying anything, make sure that you have a full backup of macOS. You can back up your Mac with Time Machine. Note that Time Machine cannot backup Windows partition. Please first, check for updates. On your Mac, go to Apple menu > System Preferences, then click Software Update. As you can see, in this example, number 4 indicates that Boot Camp disk is disk0s4. And now run Boot Camp assistant. It works for me. Thank you for this post. It works for me too, my friend thank u. Thanks man, you saved my MacBook. Works like a charm. I had a windows 10 bootcamp disk but its deleted?